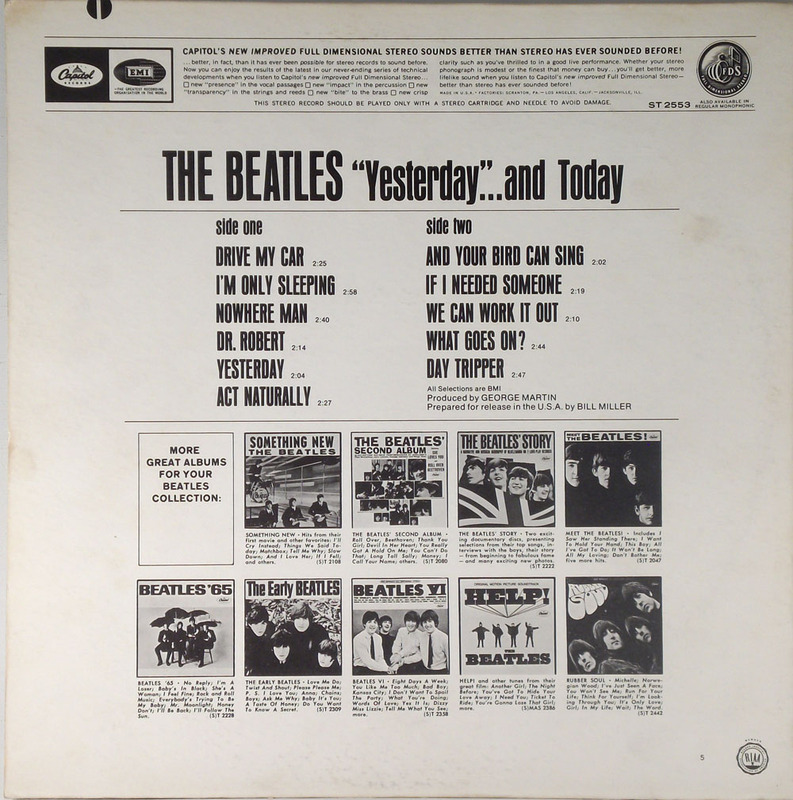 A promotional poster for the Yesterday and Today album. Record collecting is a vast hobby, and often an obscure one. The prices that collectors pay for certain records would likely baffle a large segment of the public, and many valuable records are those by artists that aren’t even well known to the public at large. …all because of the album’s cover, rather than the content. 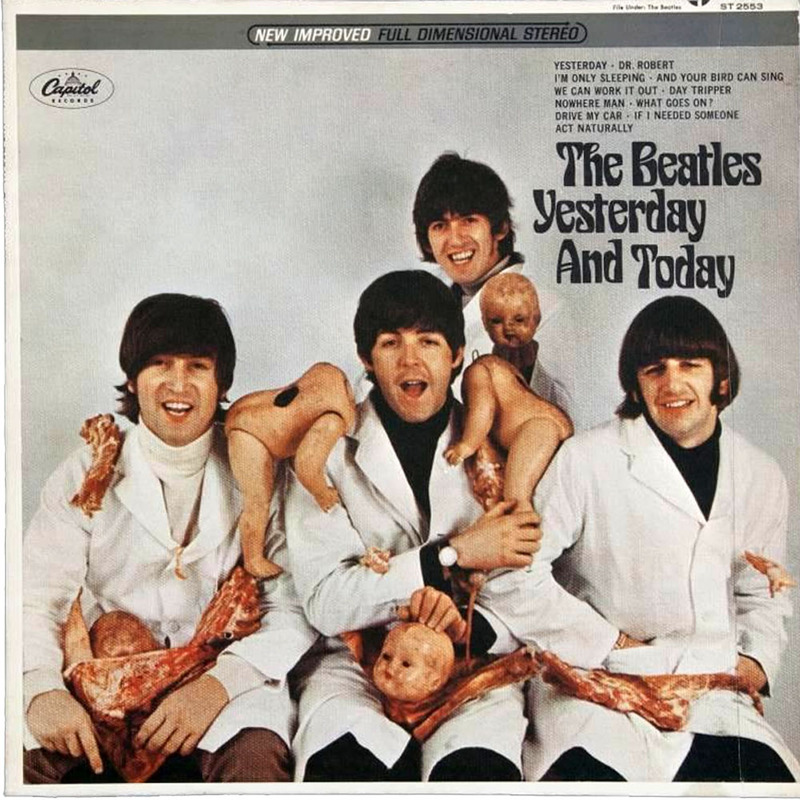 The Yesterday and Today album, released in June 1966, was originally printed with a cover depicting the Beatles dressed in butcher smocks, surrounded by pieces of raw meat and plastic doll parts. Due to public outrage, the album was quickly withdrawn and the cover replaced by one with a more modest design. 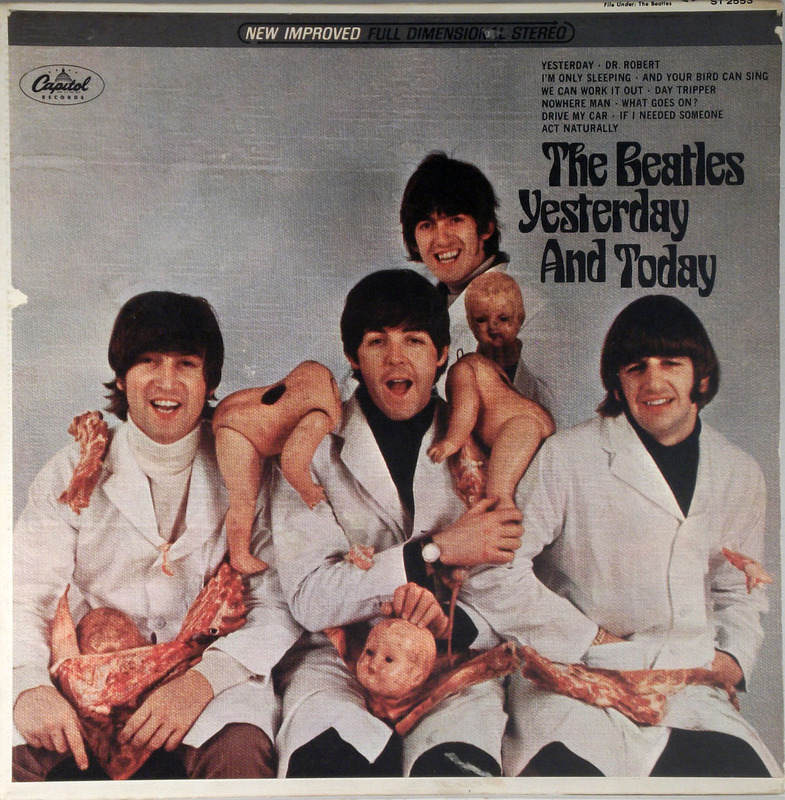 The value of the copies of Yesterday and Today with a Butcher cover lies with the cover itself; the records within them are relatively common. For those interested in owning a Butcher cover, there is both good news and bad news. The good news is that Capitol Records produced the better part of a million copies of that album in 1966. The bad news is that many of those covers were either destroyed or altered, and the surviving examples can often sell for a breathtaking amount of money on the collector’s market. In this article, we’re going to discuss the infamous Butcher cover in detail, outlining the history of the album and cover, the various versions of the album that exist, how to identify one, and the value of the Butcher cover in the collector’s market. Is It a First State or a Good Peel? Should You Peel a Butcher Cover? 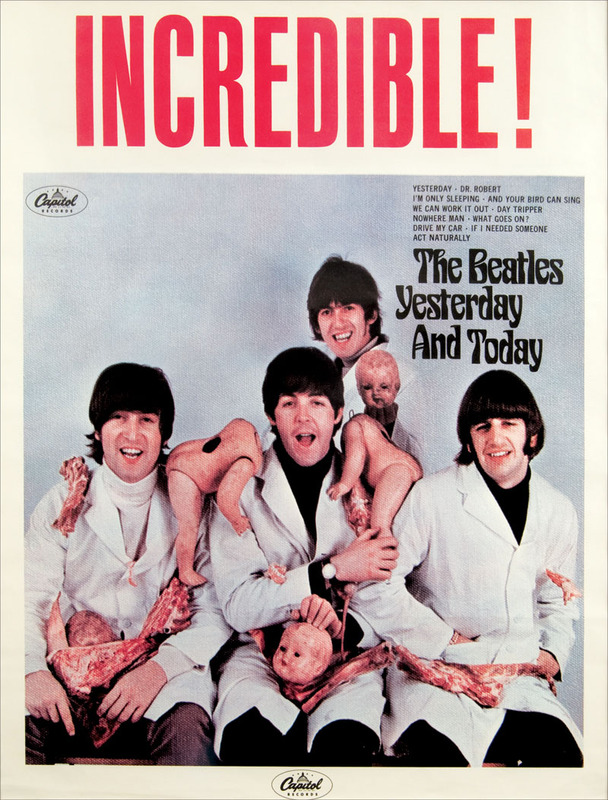 Click here to see if we have a Beatles Butcher cover in stock. Clicking on any image will open a larger version in a new window. The final version of Yesterday and Today with the Trunk cover. From January, 1964, when Capitol Records released Meet the Beatles in America, through the August, 1966, release of Revolver, the Beatles’ American albums differed in content, and sometimes in cover art and title, from their British counterparts. This was mostly due to different industry practices within those two countries. In Britain, albums usually contained fourteen songs, and ordinarily did not contain songs that had been previously released as singles. The reasoning for this was that the public might not be interested in buying expensive albums that contained songs that they had previously purchased as singles. In America, albums usually contained twelve songs, and it was quite common for albums to contain songs that had previously been released as singles. In Britain, the Beatles and their record company, Parlophone, carefully planned out their releases, choosing songs that were intended to be released as singles while assigning others to albums. In the United States, Capitol Records, spurred on by the tidal wave of Beatlemania, was interested in releasing as many albums as possible, with twelve tracks, of course, rather than the fourteen used in Britain. Fewer tracks meant greater profits and fewer royalties to pay, as the price of the album would be the same, regardless of how many songs were on it. These independent decisions led to significant differences in the Beatles’ catalog in the two countries, with far more albums being released in the United States than in Britain. By putting singles and their B-sides on albums and by cutting the number of tracks from fourteen to twelve, Capitol occasionally found themselves with enough tracks left over from various projects to release a unique album to be released only in the United States and Canada. One of these albums was Yesterday and Today, which Capitol scheduled for release on June 20, 1966. “Act Naturally” and “Yesterday” were originally on the UK version of the 1965 LP Help!, but had been omitted from the U.S. Version. “Drive My Car”, “If I Needed Someone”, “Nowhere Man” and “What Goes On” were taken from the UK version of the 1965 LP Rubber Soul and had been left off of the American version of the album. “Day Tripper” and “We Can Work It Out” had been released as a single in both the U.S. and in the UK, where those two songs had not been intended to appear on an album. “And Your Bird Can Sing”, “Doctor Robert”, and “I’m Only Sleeping” were tracks intended for the then-unreleased Revolver album, which wouldn’t be released until August, 1966. The completed track lineup is listed below. 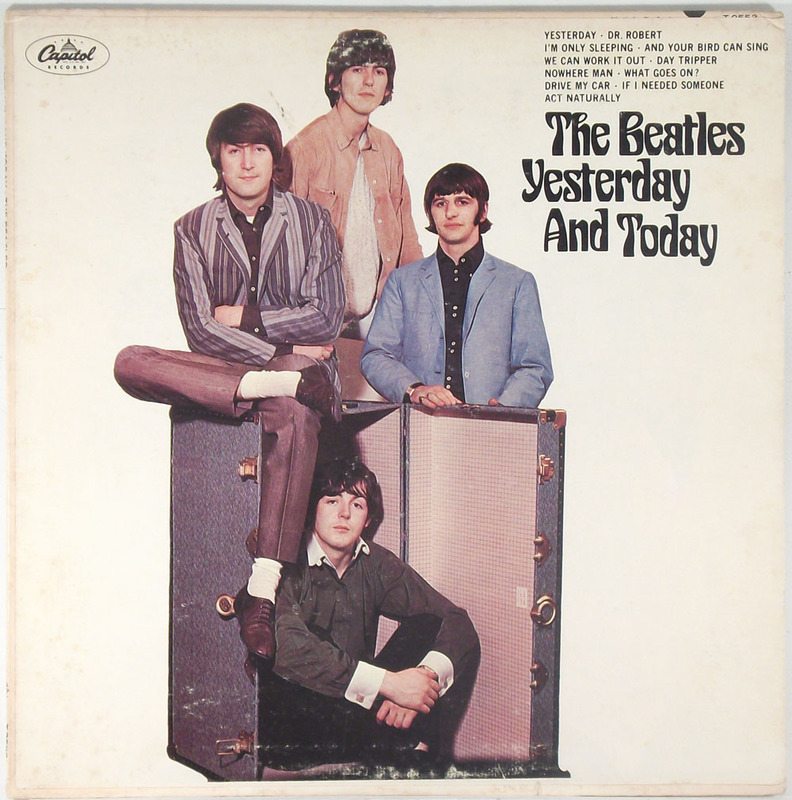 The album was given the title “Yesterday and Today” to take advantage of the song “Yesterday”, which had reached #1 on the American charts in October, 1965. The Beatles were reportedly unhappy with the way that Capitol records reconfigured their intended releases, but were unable to do anything about it. This was eventually resolved when the group signed a new contract in 1967, and all releases from that time forward were identical in both the U.S. and the UK, as per the Beatles’ wishes. As for Yesterday and Today, the Beatles likely knew as little as the American public about the content of the album prior to its release. With the track listings for Yesterday and Today all set, the only thing left for Capitol to do was come up with a cover design for the album. As Yesterday and Today was intended to be a North American-only release (it would also be released in Canada), Capitol had not received artwork from Parlophone, and requested that the band’s management provided them with suitable artwork for the album cover. The photos supplied came from a photo shoot that the band had done in March, 1966 with photographer Robert Whitaker, which were originally intended to be used for a piece of conceptual art called “A Somnambulant Adventure.” For these photos, the Beatles were dressed in butcher smocks and sat on or stood around a bench while surrounded with parts from plastic dolls and raw meat. Though these photos were not taken with the intention of using them for an album cover, the band’s management submitted them to Capitol, and one of the photos was chosen to be used for the cover of the Yesterday and Today album. Whitaker had no idea that he’d inadvertently created the Butcher cover. A copy of the letter Capitol sent to reviewers asking for the albums to be returned. 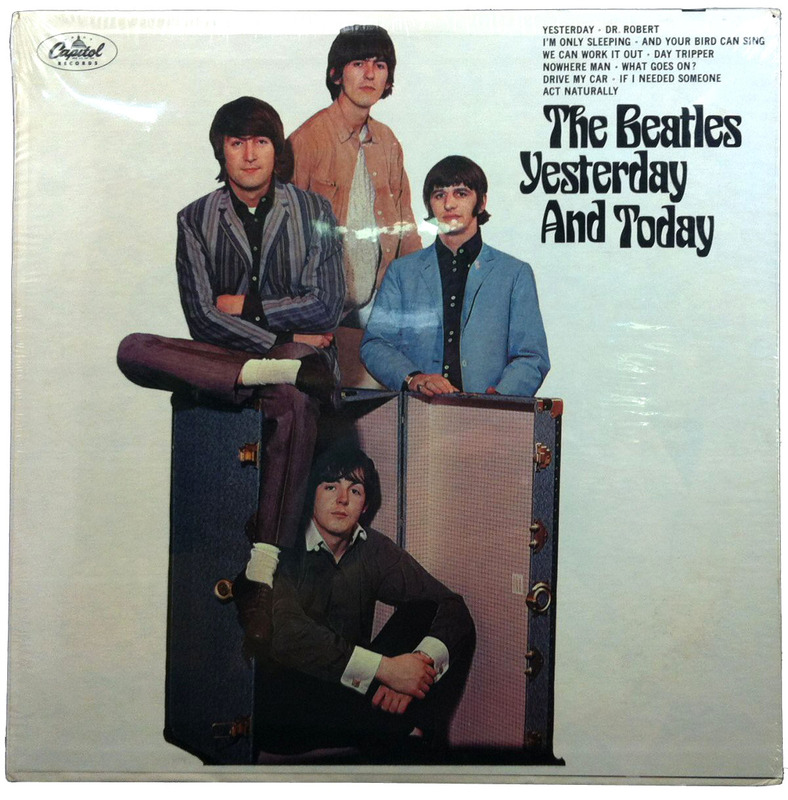 As Beatles albums had continued to sell well since their arrival in America in early 1964, Capitol had high hopes for sales of Yesterday and Today. In anticipation of this, the company printed some 750,000 covers at their three pressing plants – Los Angeles, California, Scranton, Pennsylvania, and Jacksonville, Illinois. The front cover slicks for the cover were printed on a special paper with a slightly rough texture, and the photo used was given a slightly grainy appearance in order to make the finished cover look somewhat as though it had been painted on canvas. At the time of the release of Yesterday and Today, record companies in America were still pressing records in both stereo and mono, as stereo records were playable only on stereo equipment and most buyers only had mono record players. Because of this, approximately 80%-90% of the finished covers were in mono, with the remainder in stereo. Several hundred copies of the finished Yesterday and Today album were shipped to radio stations and reviewers in order to help the album receive press attention prior to release. Most of the remaining copies were shipped to distributors around the country. Due to the controversial image depicted on the cover, reaction to the album from the few people who received advance copies was predictably hostile, and distributors and retailers expressed concern about the cover art. As the album’s release date approached, Sir Joseph Lockwood, the chairman of EMI, the company that owned Capitol Records, made the decision to recall the album. Distributors and reviewers were asked to return all copies of the album to Capitol Records, as described in an article in a contemporaneous article in Billboard magazine about the struggles of distributors to return the albums with the Butcher cover to the record company. 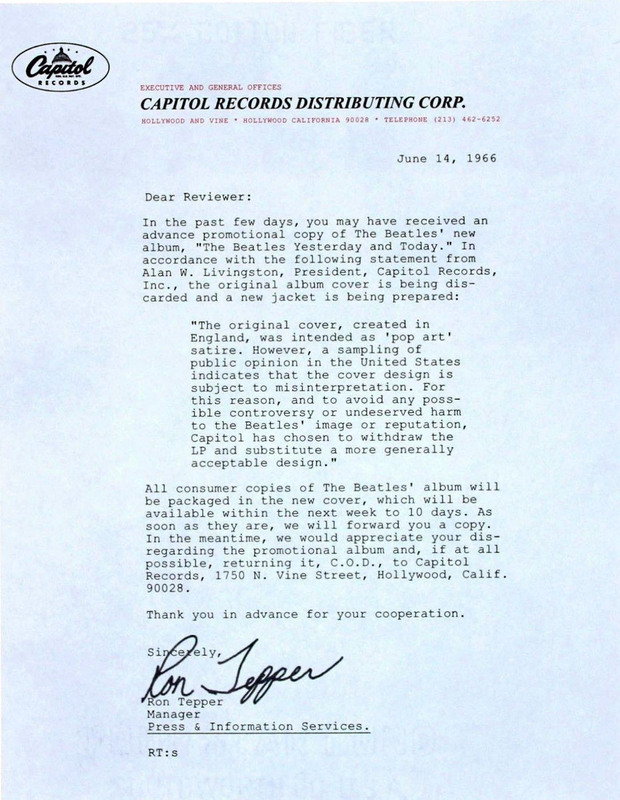 It’s worth noting that while the copies of the Butcher cover that were sent to reviewers ahead of the release date are valuable, so is the letter from Capitol requesting that the album be returned to them. While photocopies of the “Butcher cover recall letter” are common, originals are not, and collectors have paid several thousand dollars for original copies of the recall letter. Capitol quickly came up with a replacement cover design; this one was much more innocuous and depicted the band surrounding a steamer trunk. This image may have been considered for use as the original cover of the album, and several different prototype cover slicks exist with slight variations on this image. The decision then needed to be made as to what to do about the returned albums, that had the design that would soon be known as the “Butcher cover.” The decision regarding what to do about the covers may have been made at the corporate level or by individual plant managers. At the Jacksonville, Illinois, plant, all of the returned copies had the records removed and the covers were reportedly taken to a landfill, where they were dumped into a hole that was then filled with water. At the Los Angeles and Scranton plants, a different decision was reached – the cover slicks with the new artwork would be pasted over the existing “Butcher cover” slicks. This process proved to be less expensive than reprinting the covers completely, but was also more time consuming. Not only was the process of precisely aligning a new slick over the old one a difficult task, but the finished covers also had to be trimmed at the mouth (the right edge) to account for any misalignment at the opening of the cover. Once the covers were either reprinted (Jacksonville) or modified (Los Angeles and Scranton), the albums were again shipped to distributors for their June 20, 1966 release date. It has been estimated that the cost (in 1966 dollars) of Capitol’s recall of Yesterday and Today cost the company some $250,000, and effectively wiped out any profits the company was likely to see from the album in the foreseeable future. 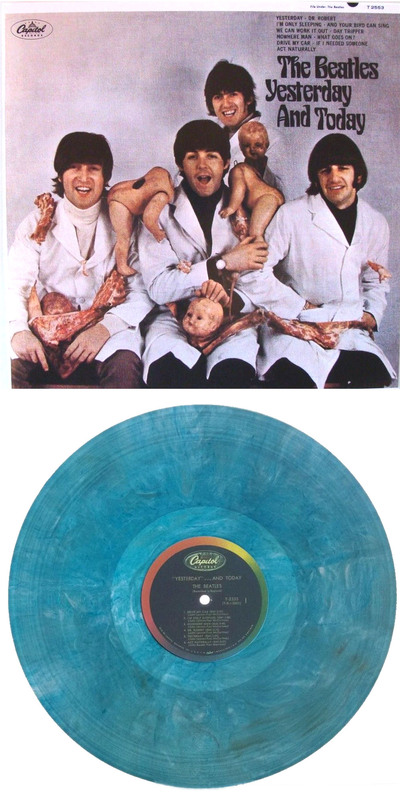 It’s worth noting that the Butcher cover was released in the United States only in the vinyl format. Reel to reel tape and 8 track tape versions of the album were not issued until about a month after the record. By this time, the decision to use the second cover had already been made. 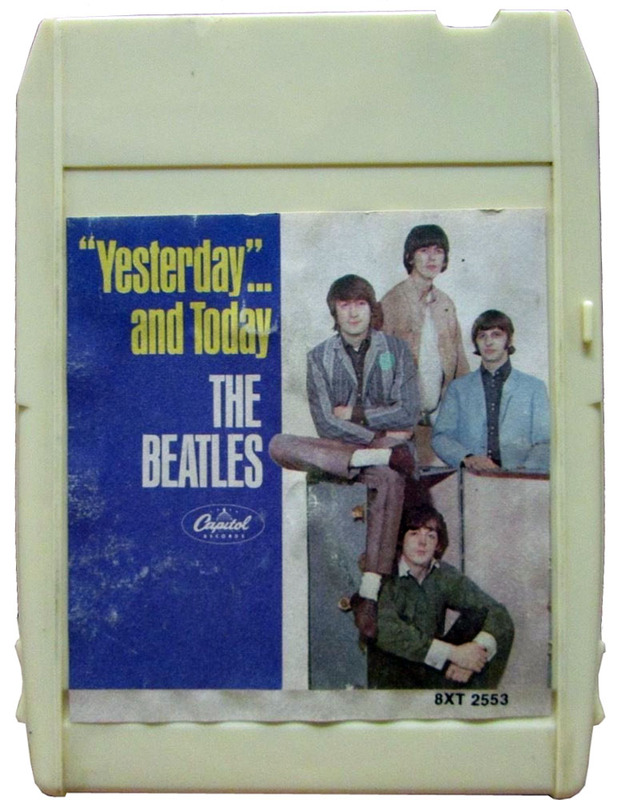 Cassette copies of Yesterday and Today were not released until two years later and all of them were issued with the later trunk cover photo. Despite the problems with the cover, the album was released as scheduled, and promptly went to #1 on the American Billboard album charts, where it remained for five weeks. The album was soon certified gold for amassing more than $1 million in gross sales. On the day of release, the album that most buyers saw in the stores was the second cover with the steamer trunk photo. Probably half of those actually had Butcher cover slicks underneath them. A small handful of original copies with the exposed Butcher cover slick were sold at retail, though it has been estimated that only a few hundred copies were sold this way. There have been a couple of copies offered for sale on the market over the years that still had both the original shrink wrap and price sticker intact, demonstrating that at least a few copies of the original cover did reach store shelves. Reproduction of a proposed alternate album cover. The fact that the original covers for Yesterday and Today were withdrawn and replaced wasn’t a secret, and the public soon discovered that many of them had purchased albums that had a cover with a second cover underneath. Not only that, but it was fairly easy to see the old cover under the new one on most copies, as the new cover was mostly white and the cover underneath was quite a bit darker. In addition, due to the haste with which the new slicks were applied to the old covers, many covers had trunk slicks that were slightly misaligned, making it even more obvious that there was another cover underneath the trunk cover. A few enterprising individuals discovered that steam from a tea kettle could be carefully applied to the cover, which allowed the trunk slick to be removed and the Butcher cover underneath to be exposed. With time, the glue used to attach the trunk cover slicks became pretty secure, and attempts to peel the covers using steam became less successful, resulting in thousands of badly damaged and largely useless Butcher covers. Within a few months, all of the “pasteover” copies of Yesterday and Today had been sold, and by the end of 1966, all of the copies seen in stores were copies that had been manufactured with the trunk cover only. By January, 1967, four distinctly different versions of Yesterday and Today were in existence. These were the original issues with the “Butcher cover” photo, the second version of the album, with the trunk cover slick pasted over the Butcher cover, the buyer-created “peeled” versions with the trunk cover removed, and the fourth version, which was manufactured with the trunk cover slick. While all versions of the album are currently sought out by collectors, the first issues are unquestionably the most prized and the most valuable. The second issue is also quite valuable, and the third issue may or may not be, depending on condition. The fourth version is of interest only to hard-core Beatles collectors and people who simply like the Yesterday and Today album, which, the opinion of the Beatles themselves notwithstanding, is a pretty good collection of songs. A rare stereo First State Butcher cover. The original issues of Yesterday and Today, which never had the trunk slick pasted over them, are among the most valuable and sought out albums in all of record collecting. While 750,000 of them were printed, most were either destroyed or had trunk cover slicks pasted over them. In the end, only a few hundred examples of these first issues survive today. First State stereo issues of the Butcher cover are much rarer than their mono counterparts, and outnumber them by a ratio of roughly 10:1. The copies of Yesterday and Today that were shipped to stores with trunk cover slick pasted over the Butcher cover slick (and still have them attached) are known as Second State Butcher covers. Second State issues are much more common than First State issues, as several hundred thousand copies were probably shipped to distributors and retailers in 1966. While Second State Butcher covers were common in 1966, they’re significantly harder to find a half a century later. Over time, many of these albums have ended up in the trash, as albums often do, and quite a few of them were likely owned and eventually discarded by people who had no idea that they owned a version of the Butcher cover. Even among surviving examples of Butcher covers, Second State Butcher covers have become more rare over time, as many people have peeled them to reveal the original Butcher cover underneath, often with varying degrees of success. Because of peeling and general attrition, Second State Butcher covers are somewhat scarce today. As with First State issues, Second State Butcher covers are significantly more common in mono than they are in stereo. A nicely peeled “third state” Butcher cover. The term “Third State Butcher cover” refers to a Second State cover that has had the trunk cover removed. Third State copies of Yesterday and Today tend to come in the most broad range of conditions of all the variations of the album. Third State versions that have been professionally peeled often appear, at first glance, to be First State issues. On the other hand, Third State copies that have been badly peeled by amateurs are frequently in horrible condition, and we’ve seen examples where parts of both slicks were removed, leaving bare cardboard in places that were originally covered by the Butcher cover slick. On the plus side, poorly-peeled Third State examples of the Butcher cover are often the most affordable variation for collectors, as poorly-peeled examples might sell for less than 10% of the price of a professionally peeled Third State cover. The final version, which is not referred to as a “Fourth State” version of Yesterday and Today, is simply known as the “Trunk Cover.” These are the versions of the album that were printed after all of the Second State copies had been shipped. Trunk cover versions of Yesterday and Today have only one slick attached to the front cover and never had the original Butcher cover slick mounted underneath. The photos used for the trunk cover were from a photo shoot that was taken shortly after the shoot that produced the original Butcher cover photos. Capitol printed test slicks of several variations of the trunk cover before settling on one that had an all white background. The version with the purple surrounding the trunk was used on the 8 track version of the album, however. 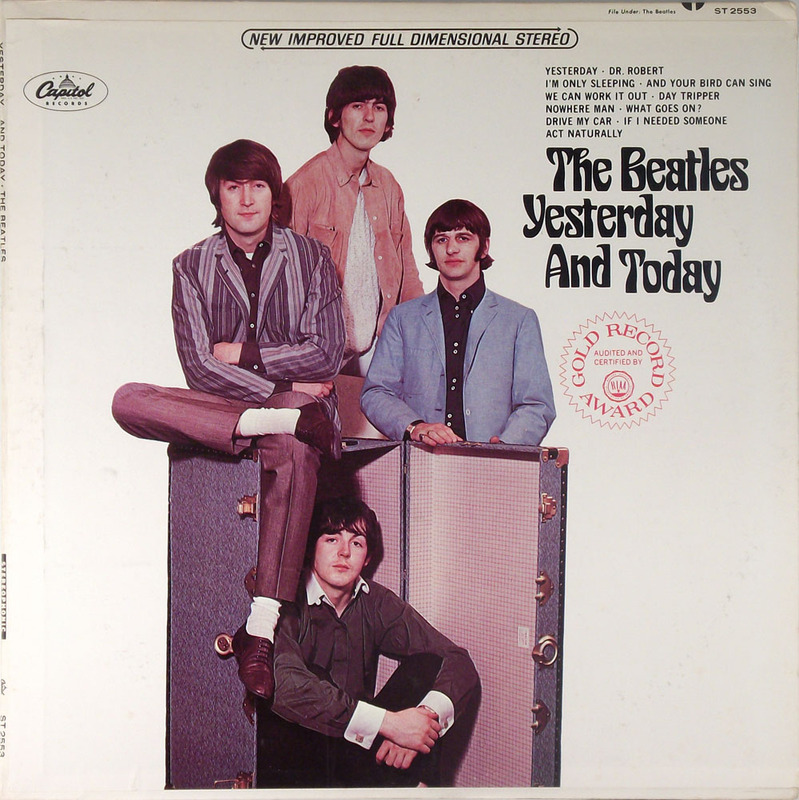 This cover was used on all copies of Yesterday and Today from June, 1966 until the late 1980s, when the album was deleted by Capitol as part of the company’s move to unify the American and British Beatles catalog. Closeup of a Second State Butcher cover. 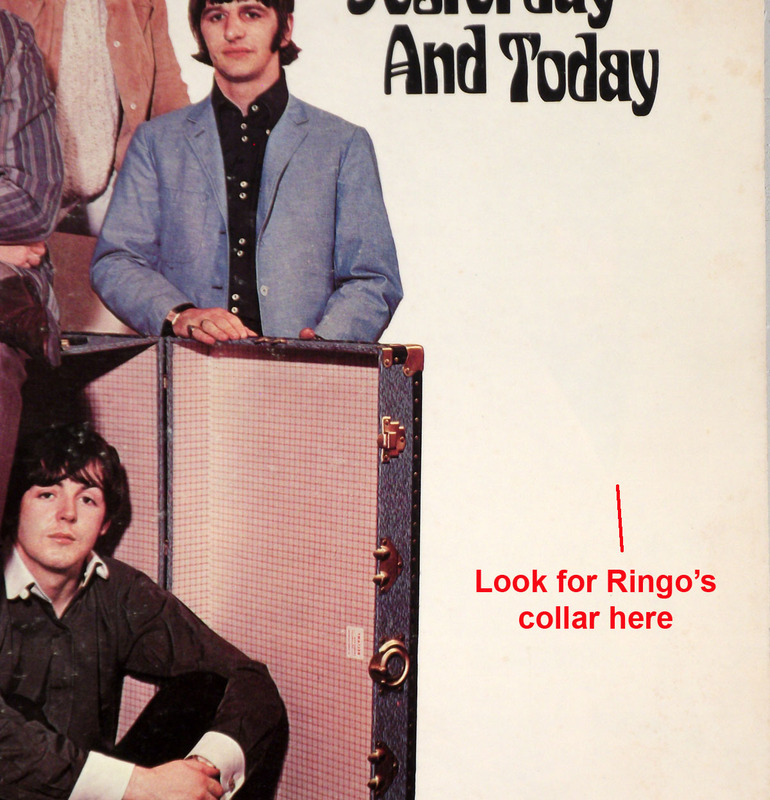 Ringo’s collar can be seen as indicated. It would seem pretty straightforward to identify a Butcher cover; after all, it has that photo on the front, right? That’s true of First State issues, which are easily identifiable as Butcher covers. It’s also true of Third State versions, as the trunk cover has been peeled to reveal the Butcher cover slick underneath. Once you know how to tell the difference, it becomes quite obvious. Parts of the artwork on the original cover were black, while large portions of the trunk cover are white. On Second State issues, there is one part of the cover in particular where the original Butcher cover can be seen through the white part of the trunk cover slick. In the original Butcher cover photo, Ringo Starr was wearing a black turtleneck sweater underneath his white butcher smock and the part of the turtleneck that appears in that photo is triangular in shape. On Second State issues, the part of the trunk cover slick that is directly above that black triangular area is all white. On Second State covers, this black triangle is always visible through the trunk cover, and it appears about 2 1/4” below the letters “oda” in the word “Today” in the album’s title. Assuming that you’re in a room with good light or outside in sunlight, the triangular area will be plainly visible. You won’t have to strain or struggle to see it; if you can’t see it, then you’re holding a later trunk cover version of the album. Many later trunk cover issues of Yesterday and Today have a red emblem in this same location, indicating that the album received a gold record award from the Recording Industry Association of America for achieving more than $1 million in sales. If this emblem appears on the cover, then the album in question is NOT a Second State Butcher cover. If you do find that you’re holding a Second State Butcher cover, it’s also possible to tell which pressing plant made the album. If you examine the lower right hand corner of the back cover, you will see a small logo for the RIAA. Next to this logo is a number. The number will identify the pressing plant. 2 – A stereo cover that came from the pressing plant in Scranton, Pennsylvania. 3 – A mono cover that came from the pressing plant in Scranton, Pennsylvania. 5 – A stereo cover that came from the pressing plant in Los Angeles, California. 6 – A mono cover that came from the pressing plant in Los Angeles, California. A Butcher cover from the Jacksonville, Illinois, pressing plant would have the number 4 on the back cover, but all but a handful of First State issues from the Jacksonville plant are believed to have been destroyed, meaning that there are no Second State Butcher cover issues from that particular pressing plant. If there were, they would have a number 4 on the back cover. While many Second State Butcher covers have been peeled by amateurs using steam or other methods, these results are often unreliable and can result in badly damaged covers. There are, however, a few people who have found nondestructive methods for peeling Second State issues that can result in a finished product that is virtually indistinguishable from a First State issue. The difference in price in the collector’s market between a First State issue in exceptional condition and a Third State issue in similar condition can be many thousands of dollars. How can one tell the difference? There are several ways to tell if you’re looking at a true First State Butcher cover or are instead looking at a Third State version where someone has done an exceptional job of removing the trunk cover slick. Most covers that have had the trunk cover slick removed will have a some glue residue on them. Under bright light or sunlight, this glue residue can be seen in the form of streaks or rings on the cover. These streaks or rings may be faint, but they can usually be seen under strong light. Another way to check is to get a piece of tissue paper and lightly moisten it (don’t get it too wet!.) Place the damp tissue on the cover and allow it to dry. Once it’s dry, try to remove it. If the tissue sticks or offers resistance when you try to remove it, then the cover in question is a peeled Third State issue. If it removes easily or can be removed by simply blowing on it, then you may, indeed, have a First State issue. All Second State versions of the Butcher cover were trimmed prior to being shrink wrapped. Because of this trimming, which was done to address alignment issues at the right side, or mouth, of the cover, a Second State Butcher cover will not be quite as wide as a First State cover. First State covers will be about 1/8” wider than Second State covers. Should you not have a First State cover handy for comparison, and few of us do, you could also compare the cover in question to other Beatles albums of the same period. At the moment, we happen to have a Second State cover on hand, and it measures 12 1/4” wide. A copy of The Beatles Second Album that we have on the shelf measures about 12 3/8” wide in comparison. As we’ve mentioned the difference in price between a First State issue and a nice Third State issue can be $10,000 or more. Be sure you know what you’re buying before you buy. A poorly peeled Butcher cover. Don’t try this! In 1966, it was often possible to turn a Second State Butcher cover into a very presentable Third State version by simply using steam from a tea kettle to remove the trunk slick from the cover. We’ve seen copies where this was done that looked nearly identical to First State issues. Those days are long gone; some fifty years of aging has pretty much rendered the adhesive impervious to steam. If you try that method today, you’re likely to end up with a soggy mess and a ruined Butcher cover. Short version: Don’t attempt to peel a Butcher cover yourself! Period. Don’t do it. We’ve seen numerous horrible examples of covers that were ruined by amateurs who were attempting to peel their cover themselves. Consider this – a really nice Third State cover in stereo can sell for as much as several thousand dollars. A ruined one might sell for $0. There are individuals who have developed methods of removing the top slick using various chemicals. These processes usually work quite well, and the results are often nearly indistinguishable from First State issues. Of course, these people who can peel a Beatles Butcher cover using these methods are professionals, and they charge a fee for the service. Still, if you own a Second State Butcher cover, it may (or may not; read on) be worthwhile to consider having it professionally peeled. Obviously, such a decision must lie with the individual, but there are several factors to take into consideration when considering whether or not to peel a Second State issue. All versions of the Butcher cover are collectible, and collectors are interested in owning all three versions in the best possible condition. All three are relatively uncommon, and the First State versions are quite rare. Second State versions, however, are becoming increasingly rare, as many thousands of them have been peeled over the years. As these records were sold when new as Second State issues, they have value to collectors “as-is”, that is, in their original unpeeled state. If your Second State version is in pristine condition, be it still sealed or perhaps still in the original shrink wrap, or even in mint condition, you should probably leave it alone. It’s worth the most it’s ever going to be worth in its current condition. Keep in mind that Second State Butcher covers are collectible in their own right, as that’s the way the album was sold when it was first released to the public. Every time someone peels one, there’s one less Second State Butcher cover left in the world. As time goes on, they’re becoming increasingly rare. On the other hand, if there are any problems at all with the front cover, it may well be beneficial to have it professionally peeled. Such problems might include either excessive front cover wear or perhaps writing on the cover. Another example would be excessive foxing, which is an age-related deterioration of the paper that causes brownish spots or blotches to appear on the cover. Foxing is most commonly seen on white paper, so it shows up often on Second State Butcher covers that have been improperly stored. Again, the decision is up to you. Collectors are paying surprisingly high prices for Second State issues in better than average condition these days. If your Second State Butcher cover is in exceptional condition, you won’t increase its value in any way by having it peeled. If it has problems, however, you can turn a so-so Second State issue into a very nice and more valuable Third State issue by having it professionally peeled. If in doubt, you might want to consult with someone who peels them professionally. They can make a recommendation, and the pros will tell you if you have an example that would be best left alone. 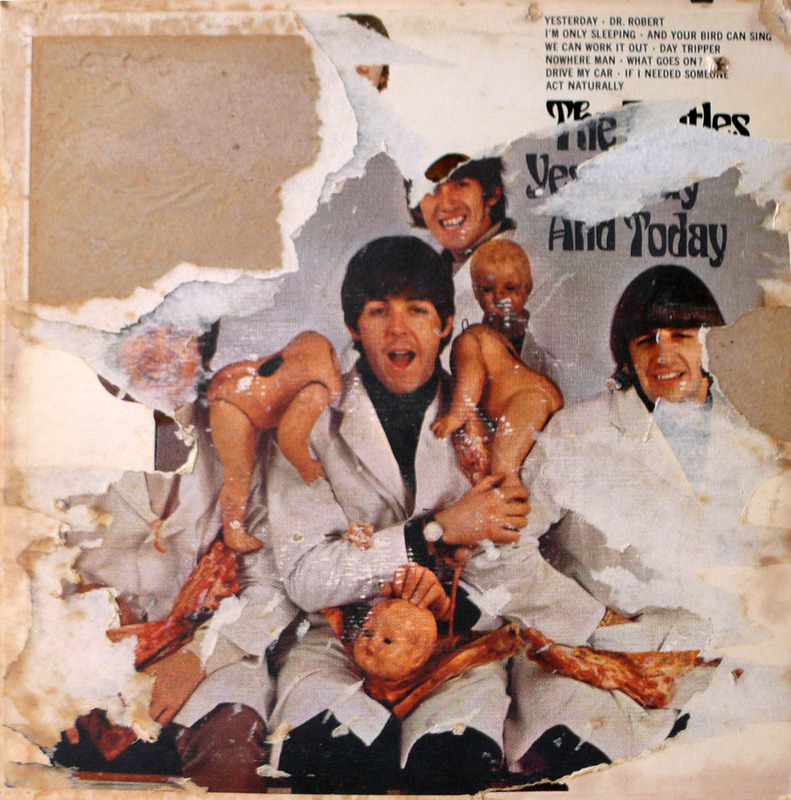 Whatever you do, don’t try to peel a Beatles Butcher cover yourself! A sealed, unopened mono Second State Butcher cover. With most records, establishing value is usually pretty easy. There is usually one version of a record that’s collectible, and there’s a “going rate” for mint copies, with copies in lesser condition selling for less, with the price determined by the condition. Establishing values for Butcher covers is a bit more complex, as the price is determined by many factors, instead of just the condition. State – Is it a First State, Second State, or Third State issue? Each version has their own price ranges. Format – Is the album a mono version or a stereo version? Mono copies are substantially more common than stereo copies, so stereo copies will sell for higher prices. On the other hand, the values don’t correspond to their rarity. There may be ten times as many mono copies as stereo copies, but stereo copies usually only sell for about twice as much money. Condition – As with any collectible, condition is of the utmost importance in determining the value of a Butcher cover. The better the condition, the higher the price. Values for unsealed, opened copies of First State issues have sold for anywhere from $5000-$25,000, depending on whether they are mono or stereo. Collectors are also interested in still sealed Second State issues. While Second State versions are more common than First State issues, sealed copies are quite rare, as most people who bought the album in 1966 opened them and played them. Sealed mono Second State versions have sold for $5000-$7000 and stereo copies have sold of upwards of $10,000. Pricing for Second State issues can vary widely, though nice mono examples often sell for $500-$1500 and stereo copies from $1000-$3000. The widest price ranges come with Third State issues, as the condition for copies seen on the market is all over the map. We’ve seen badly peeled Third State copies sell for as little as $50, and the condition was so poor that we thought even that price was generous. Then again, truly pristine, professionally peeled stereo Third State issues have sold for as much as $3000, and we recently saw a nicely peeled mono Butcher cover sell for nearly $2500. It all depends on condition. One nice thing about Butcher covers is that the demand is always there, regardless of condition. This is the one record that everyone seems to know about, even if they’re not Beatles collectors or even record collectors. Most record collectors, regardless of their interest in the Beatles, would like to have a copy of the infamous Beatles Butcher cover in their collection, and for those types of collectors, condition often doesn’t matter. We’ve found that badly peeled Third State versions are often the easiest ones to sell, simply because they’re the most affordable for buyers. Few people have $25,000 at hand for a First State Butcher cover, but nearly everyone can find $100 or so for a badly peeled Third State version. Once you own one of those, you can rightly claim that you own perhaps the most famous record in all of record collecting. It’s worth noting that the prices listed above are the highest examples of prices paid for pristine copies of Butcher covers in various configurations. Most copies offered for sale sell for less, though prices can vary widely according to condition, state, format, and the fluid nature of the collecting market. A copy of the letter that accompanied some of the Livingston Butcher covers. While a First State Butcher cover is generally regarded as the most desirable variation of the Yesterday and Today album, the ultimate example to own would be to have a copy of a so-called “Livingston” Butcher cover. Alan Livingston was the president of Capitol Records in the 1960s, and he signed the Beatles to Capitol Records. He was also president of the label at the time of the release of Yesterday and Today, and he is the man who made the decision to have the original cover withdrawn. Withdrawn they were, with most copies replaced with Second State issues with new cover slicks pasted over the original. Before the covers were altered, Livingston put twenty four sealed copies of the First State Butcher cover in a box and took them home. Nineteen of those copies were mono, and five were stereo. Twenty years later, in 1986, Alan Livingston’s son Peter appeared at a Beatles convention in Los Angeles with four sealed First State copies from his father’s box – two in mono and two in stereo. He sold three of the four records that day, and eventually sold all of them. 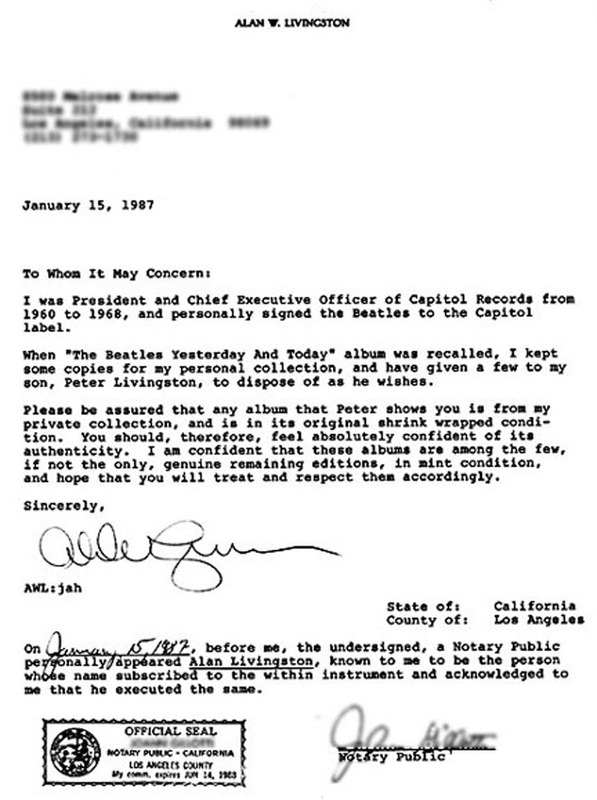 Peter Livingston also arranged to have his father sign a notarized letter stating that he was the president of Capitol Records in the 1960s and that the accompanying record came from his personal collection. A so-called “Livingston” Butcher cover is now among the most highly sought out records in all of Beatles collecting. With so few of them available and the impeccable provenance that comes with the letter, the prices paid for Livingston Butcher covers have steadily increased since Peter Livingston sold them for $1000 (for the mono) and $2500 (for a stereo copy) in 1986. It has been nearly a decade since either a mono or a stereo Livingston Butcher cover has appeared for sale, but the last mono copy sold for $44,000 and the last stereo copy sold for $85,000. We personally know a collector who has offered $125,000 to one of the five owners of a stereo copy, and his offer was politely declined. In time, it’s possible that a stereo Livingston Butcher cover may sell for $250,000, though at least one of those owners has vowed never to sell. You can read more about the Livingston Butcher cover here. Since the original release of Yesterday and Today in 1966, the album has been released in only two other countries – Canada and Japan. The Canadian release was contemporaneous with the American version and was intended to be issued with the same cover with the infamous Butcher photo. Unlike the American copies, which were already in transit to distributors and retailers at the time of the recall, the Canadian pressings were still in the production stage. Because of this, no Canadian versions of the Butcher cover were ever shipped to distributors or stores. Paul White, former vice president of Capitol Records of Canada, had received two completed mono covers and a Butcher cover slick (not a completed cover) for the stereo version from the printer that was producing the cover. He gave one of the mono copies to an associate and he kept the other one, along with the stereo slick. To date, no other examples of a Canadian mono Butcher cover has surfaced, and no completed stereo covers are known to exist. All copies shipped to stores from the day of release used the trunk cover photo, there are are no Canadian Second State copies in existence. 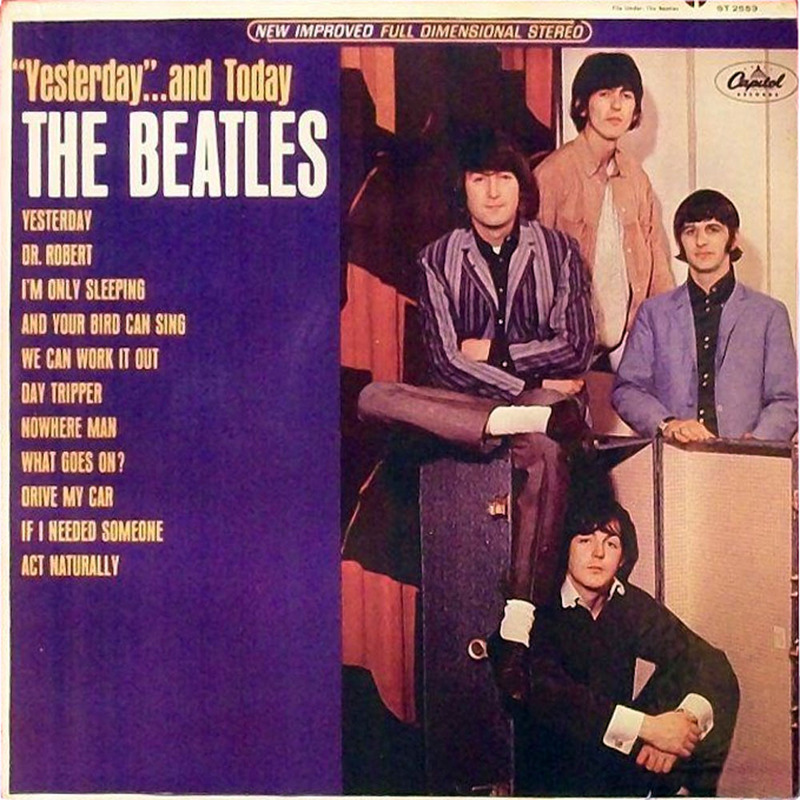 The Japanese version of Yesterday and Today was not released until 1970. All copies ever printed in that country used the artwork with the trunk cover. Sooner or later, it always happens. When a manufactured commodity becomes rare and demand increases, someone tries to fill that demand. In the case of rare records, that always comes in the form of duplication, or counterfeiting. Like many rare Beatles records, such as Introducing the Beatles, the First State Butcher cover has been counterfeited on several occasions. Most of these copies can be easily detected by anyone with even passing familiarity with original 1960s Capitol Records Beatles albums. The cover construction is usually different, and the printed covers usually have a slick, rather than a slightly rough, texture to them. The vinyl used on the records is usually thinner than those used on the originals, and many of the counterfeits are accompanied by colored vinyl records. All original examples of the Butcher cover were shipped with black vinyl records. While most counterfeit Butcher covers are copies of the First State issue, there are also counterfeit trunk covers that appear to be pasteover (Second State) issues, complete with a faint outline of Ringo’s collar in the white area next to the trunk, as you would see on a true pasteover. The copies we’ve see like this have flimsy cover construction, poor print quality, and incorrect height measurements, as they’re about 3/16″ shorter than an authentic copy. The most recent counterfeit pasteover that we’ve seen appeared to be a stereo issue, and said so on the front and back cover, but had a number “6” in the lower right hand corner, which is ordinarily found on mono issues. The going price for current counterfeit pressings is about $40, and many collectors find that to be an acceptable price. Be aware, however, that these pressings are unlikely to increase in value in the future, as they’re only imitations and not the real thing. Without a doubt, the Beatles Butcher cover is the most famous and infamous record in all of record collecting. They are rare, they are interesting, and they just happened to be a product of the most famous rock and roll group in the history of the medium. All of those things combine to make the Butcher cover one of the most fascinating albums in the record collecting hobby, and it’s likely that mint condition copies of all three “states” of the album will continue to rise in value in the future.